Michael Leonard interviewed author Tom Dolby about his novel The Sixth Form , romantic obsession, the cost of privilege and affluence, and attraction between opposites. Interviewer Michael Leonard: The Sixth Form has some dark themes running through it – obsession, lust, and the control of the naïve, along with the cost of privilege and affluence. How did your own experiences inspire the plot? Tom Dolby: I have certainly experienced romantic obsession in my life; with Hannah, what inspired her was the idea that some people walk a very fine line between sanity and insanity. They are functional, dynamic, creative, intelligent people, and yet they have a dark side that can push them over the edge. Hannah is a woman who was disappointed one too many times, and so when she is confronted with Ethan, he appears to be the perfect “prey,” if you will – even though she masks it as an opportunity for friendship and ultimately romantic love. As far as privilege and affluence, I’m not sure if there’s an inherent cost, but I think that how kids are raised against that background has a lot to do with whether they will enter the world as responsible people or not. Berkley Academy is essentially a playground for a lot of the students, and it serves as an atmospheric location. Tell us about the setting - how difficult was it recreate the very special atmosphere of this Academy? I was certainly inspired by my own experiences at boarding school in terms of the setting, though the book is not autobiography or memoir in any way. Once I got going, it was pretty easy to reach back to those memories of the specific places at the school, remember what they meant to me, and then to place my characters in them. Ethan comes from quite an accomplished middle-class and well-educated family. Why, then, does he feel so out of place at Berkley? I felt that for Ethan, even though his parents were not disadvantaged, they didn’t share the same values as many of the other families at the school, so Ethan couldn’t relate to the lifestyles that some of the kids experienced at home. Also, many parents of privileged children don’t really care if their kids learn or not; they simply want them to get good grades. Ethan’s parents were different, in that they took a more holistic approach to his education. Ethan certainly sees Todd Eldon as a kindred spirit even though, at first glance, they appear to be total opposites - Todd is the extrovert and Ethan is the reticent, shy, artistic type. What do you think initially attracts them to each other? What do they both get out of their friendship? It’s the old “opposites attract” syndrome. Todd is attracted to Ethan’s intelligence, because Todd’s friends are exactly the intellectual types. He doesn’t realize until later that there’s a physical element to it as well. And while Ethan is not attracted to Todd physically, he fantasizes about this idea of being popular, of being at ease with the world, which is the appearance that Todd gives off. He believes that if he hangs out with Todd, some of these qualities might rub off on him as well. Who do think is the most insecure? I think they’re both insecure in different ways. Ethan is definitely more insecure at the start of the book, and then I think as Todd’s sexuality issues come into play, he starts to realize that his world isn’t very solid, either. Ethan is a little taken back by Hannah McClellan's advances even as she flatters him at the local Cafe. What initially makes him visit her at her house, and later, what is it about her qualities that make him want to start spending afternoons with her? I think it’s a combination of curiosity and loneliness. He’s fascinated by this older woman who is the first adult to treat him as an equal. She represents the outside world, everything that lies beyond Berkley’s borders, and so that, of course, is appealing to him. The kiss between Ethan and Todd is a pivotal moment. Ethan tries to imagine it as an every day occurrence, but then tries to forget that it happened, and he's certainly not repulsed by it. Why do you think he reacts in this way and what effect does it have on their friendship? Ethan pretty much blocks it out, because he can’t reconcile the thought of the accidental kiss with his guy-to-guy friendship with Todd. I think, though, that there’s a small part of Ethan that feels that while he didn’t enjoy the kiss on a physical level, there was a greater connection that the two of them share, a greater bond, that was manifested by the kiss. It seals them together, not as lovers, but as friends. When Ethan is invited to spend the weekend in Manhattan with Todd and his mother, Jackie, he's overwhelmed by this "thrilling new world." Why do you think Ethan is so swept away by Jackie and Todd's lives in New York? Jackie’s world is particularly flamboyant and extravagant, and this is very new to Ethan. While those are not values he particularly subscribes to, he still finds it all very alluring when it is presented to him. You give Jackie some fascinating traits; she actually comes across as a real "woman of the world." She seems to have an interesting relationship with Todd. Where did you get the idea for such a character? I had been writing that character since college, in various forms. She originally appeared in a short story about a boy who moved to Japan with her after his father died, and she was a romance writer in that story as well. I love the idea of a mother who is a bit off the rails, who breaks the mold of a more traditional disciplinarian. Perhaps the "twist" in the story is that Todd finds himself questioning his sexuality and not the more sensitive and artistic Ethan. Indeed, when Todd starts experimenting sexually, he seems to go in a different direction from Ethan. How do Todd's struggles impact his view of the world and of Ethan? I think Todd has always been somewhat precocious, and so even when he is confronted with this new development in his life, he pursues it with the same energy that he does everything else. Of course, he’s stymied by the fact that it’s not considered socially acceptable in his world to be gay. I think he’s grateful, though, to have Ethan in his life, because even though Ethan isn’t gay, Todd senses that he won’t judge him. At what point do you think Todd realizes that he's more attracted to boys than girls? Or is he, in fact, "one of those sexual chameleons who refuses to be labeled?" I think he’s always realized it to some extent or another. He’s not bisexual, but I wanted to present the possibility, because he does have sexual relationships with girls at the start of the book, so I felt that he should at least consider that he might not want to go solely one way or the other. What qualities in Ethan and by Todd do you most admire? Which of them do you think comes away with the most emotional growth at the novel's end? I think they both grow emotionally at the novel’s end: Todd finally confronts his own sexuality and comes to terms with himself, and Ethan has his first experience of a real love affair, realizing that sometimes one needs to let go. I admire both of them for their courage, their precociousness, and ultimately, their level of self-examination. Hannah comes across as quite a good teacher, but she doesn't seem aware that her actions carry consequences in the wider world. As the story shows, people talk, especially in regard to the past games that she's been playing with younger men. Keeping this in mind, do you think she ever considers her reputation or the cost of her actions on those around her? In a boarding school environment (and in many closed environments in general), people tend to look the other way when they are confronted with something they don’t like. It’s a lot easier to stay quiet than it is to say something. I don’t think she thinks much about her actions, until they close in on her. Ethan is fascinated by the fact that someone as sophisticated and worldly as Hannah actually likes him. What do you think this tells us about Ethan's character? He is deeply insecure, and probably ready to jump at the first woman who expresses any interest in him. Why do you think Ethan ends up neglecting to head the warnings of others with regard to Hannah's inappropriate behavior? Just as people often only see what they want to see, I think Ethan believes what he wants to believe. He doesn’t want Hannah to be a bad person, and so he ignores any indications of that. Literature plays an important part in the novel. A crucial moment is when Hannah gives Ethan the two paperbacks, the collection of poetry by Arthur Rimbaud and Capote's Breakfast at Tiffany's . What is the significance of these two works, and how do they ultimately affect Ethan's feelings for Hannah? I wanted to pick two works that were romantic, but that also had some resonance in terms of their story together. There’s the Paris-New York connection, and I think Hannah wants Ethan to think about the relationship between Rimbaud and his older lover, Verlaine. I don’t ever show Ethan reading Breakfast at Tiffany’s , but if he did, I think he might imagine Hannah as having a bit of Holly Golightly in her. The fairy tale of Hansel and Gretel is constantly in the background of your novel and is a powerful symbol for Hannah, who seduces with her promises of good food, a warm bed, and happiness. How does this fairy tale serve as a catalyst for the eventual outcome of Hannah and Ethan's relationship? The fairy tale is a model for what can happen when one leaves home and is drawn into a relationship with an unknown person, whether it’s Hannah or the witch herself. I like both Ethan and Todd, and to a certain extent, I feel for Hannah as well. She’s not a good person, but she’s experienced a lot of pain in her life. In what ways do you think the relationships among the three main players - Ethan, Todd, and Hannah - are both destructive and supportive? I think their relationships always teeter right on the edge between destructive and supportive. Even the two boys become very jealous of each other toward the end of the novel. As The Sixth Form plays out, facades are stripped away and certain truths are revealed behind the masks of civility. What do you think this microcosm of wealth, class, and privilege reveals to us about American Society today? Or does it indeed reveal anything? I wasn’t trying to make a larger statement about society in particular, though I do think that human nature often reveals that people are not what we make them out to be. I suppose that in general, we tend to be very trusting of people in this country, even when we don’t know much about them. Similarly, what do you think The Sixth Form tells us about adolescence and sexual fluidity, and the kind of experimentation that seems to accompany it? I think adolescents will always have a certain amount of curiosity until they figure out where their proclivities lie. This will always manifest in different ways; the novel is just one example of that. What were some of the challenges in writing The Sixth Form ? Was it an easier novel to write than your earlier work, The Trouble Boy ? It was actually a much harder novel to write, because I was writing from several different perspectives, and the story was more layered. Do you have any favorite authors that you draw on for inspiration? There are so many; certainly one can’t write a prep school novel without reading the greats: Knowles, Salinger, Fitzgerald’s short stories. For all of us Tom Dolby fans: Do you have another novel planned? I’m working on a young adult novel right now that is set in New York City. What would you like your readers to take away from The Sixth Form ? I hope it will bring them back to their high school years, and feel a little wiser as they observe others going through the experience. I think we all have that inner part of us that’s still a teenager, and will always be able to relate to that period in our lives. Tom Dolby is the author of the bestselling novel The Trouble Boy. Born in London and raised in San Francisco, he is a graduate of The Hotchkiss School and Yale University. His writing has appeared in The New York Times, The Village Voice, and the San Francisco Chronicle. He currently lives in Manhattan, where he is working on his third novel. For more information, go to www.tomdolby.com. Michael Leonard is a contributing reviewer to curledup.com. 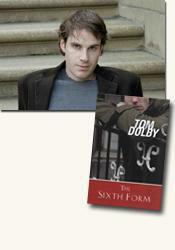 His interview with Tom Dolby was written in conjunction with his review of The Sixth Form . © Michael Leonard/2008.